PlushForums is now three years old! We're profoundly grateful to our customers for their support. We strive to earn your trust by providing the highest quality service possible, each and every day. It's fitting that on our third anniversary, we've just achieved 100% uptime for the third month in a row! We're proud of our team, and thankful for our incredible suppliers. We couldn't have done this without them. You can review our service history on the status page. May was another record month for Plush, in terms of both revenue and new signups. Our steady growth continues, and as we approach our third anniversary, the business is in robust health. Equally robust is the PlushForums platform, which is more mature and stable than ever. We hit 100% uptime for the first time in March, and 99.999% in January, February and April. Development has been mainly focused on localisation, where we now support English, French, Spanish, German, Russian, Danish and Norwegian. Please email us if you want to see Plush in your language. We're happy (and more than a little relieved) to announce our new integrated billing panel! All the features you expect are included. Customers can manage their contact information, update their credit card details, download invoices and cancel their subscriptions. Also, you can now pay for Plush in euros if you're in Europe, or pounds if you're in the UK. This marks a new level of maturity for Plush as a service. We're also making great progress on the localisation front. Supported languages now include English, French, German and Russian, with more coming soon. PlushForums now ships with free SSL support, right out of the box! This brings huge security, privacy and performance benefits to our customers. The whole system is automated using Let's Encrypt. It's completely hassle-free and ready to be activated with a single click. And we hope you do, because Google are going to make SSL a big deal in 2017. All Chrome users will start to see warnings when browsing insecure sites. That won't be an issue with Plush. Also, we're now using a CDN to serve static assets like images, which will hugely accelerate our global performance. We really want to give our customers as much as possible for their $49, which now includes SSL, Akismet spam protection, global CDN delivery and hourly backups. We're only going to keep adding value from here. PlushForums is now two years old! A sincere thank you to all our incredible, loyal customers. October was a record month, both in terms of revenue and new sign-ups. Here's to many more great years to come! Our recent focus has been on localization, and we're excited to announce that Plush is now available in German, with more languages on the way. We hope to welcome many more German, Austrian and Swiss clients very soon! If you're looking for forum software that's polished, engaging and easy to use, give PlushForums a try. Start a free trial with us today. We host a lot of gaming forums, where memes – often in the form of animated GIFs – are everywhere. The problem is, they're often very heavy files. Large enough to bring your 3G connection to its knees. To solve this, we've introduced a special click-to-play handler for animated GIFs, and added embed support for Giphy, Imgur and Twitch. We've also rolled out a slightly more fundamental feature, namely topic subscriptions. You can now receive email notifications when someone comments on your bookmarked discussions and private conversations. It's kind of an obvious feature, but we wanted to get it right. For something that sounds so simple, it's surprisingly tough to implement and scale. For instance, how do notifications operate in a real-time discussion? How do they interact with pre-moderation? And how do we send that many emails at once? In any case, we've done the worrying so you don't have to. The end result is completely seamless. We hope you like it! We love what we do, and doing it well. Our goal is to be the most polished, consistent forum experience available. That's why it's always bugged us that some aspects of Plush didn't work on mobile devices. With our latest release, we've put that behind us. Tricky features like select-to-quote, advanced search and avatar thumbnailing now work on mobile. We've also rolled out HTTP2 support, which will greatly improve mobile performance on secure forums. We've also added three more heavily-requested features. The first is a Share option below each post: something we probably should've had from the start. Second is auto-moderation, which queues posts for review if they contain specified words or phrases. Finally, we've added a secure way to access RSS feeds on private forums. This lets you create newsletters and email digests with MailChimp, even if your site isn't public. That nicely rounds out our MailChimp integration, which includes an automated two-way contacts sync, with no management required. Independent product review site Comparakeet have just published an in-depth review of PlushForums, awarding us a grade of 4.9/5! Our thanks to their team for such a thorough and fair appraisal. We were also recently featured on Product Hunt, where we were proud to be billed as "the most polished, user-friendly forum experience ever." That's our entire mission, in a nutshell. CMS Critic recently covered our one-year anniversary, detailing the many new features released to mark the occasion. Just before that, PayPal's UK Blog featured an interview with our founder Adrian Flitcroft, while PlushForums itself was featured on LifeHacker. FinancesOnline has also reviewed Plush. All modern designers are obsessed with minimalism. We're no exception, and Plush is certainly designed with minimalism at heart. But it's also a human, consumer-friendly design. Minimalism doesn't have to mean austerity. That said, a more austere style dominates services targeted at a technical audience. In the forum world, this usually means lots of white space, square buttons, grey dividers and round avatars. We like the look, but it's not a style mainstream consumer-oriented services tend to choose. But there's nothing to stop us catering to more tastes, so Plush now allows you to create that style the technical community loves. Try it using one of our new theme presets! PlushForums has been proudly serving customers for over one year now. During that time our service has improved immeasurably, thanks to the feedback and collaboration of our loyal customers. So we're thrilled to make several major new feature announcements today. First up is Localisation. Plush now works in any language! Please contact us for availability. Customers have long told us they want to send newsletters and email digests. so we've integrated Plush with the world's best email distribution service, MailChimp. And we do it right. It's a proper, automated two-way sync, with no management required. Members can unsubscribe and resubscribe via their profile. Unsubscriptions from MailChimp are synchronized back to your forum. The third major feature is Question Mode. Ideal for delivering customer service or creating a knowledge base, Q&A lets you identify the definitive answer to a question. Like all our features, it's seamlessly integrated into the user interface. Staff can work through a list of unanswered questions, ensuring no-one gets missed. We've also added MathJax integration, which our customers in academia will love. Mobile users get one-tap image uploading and insertion. There are new styling options, and we've added content flagging, so your forum is easier to moderate. Plush really has become the full package. Find out for yourself! Start a free trial today. Fate, destiny, fortune, providence. Perhaps it's pure kismet that you became a PlushForums customer? But we're not willing to leave it to chance. Instead, we've got two powerful new features to earn your business. First up is Akismet, the world's leading spam-prevention service. We've taken an enterprise subscription to their platform, and integrated it into PlushForums. That means every customer gets the best spam protection money can buy, at no extra cost! Just enable the Akismet plugin and you're good to go. We all know a picture is worth a thousand words, or so the saying goes. Images in a PlushForums discussion are big and bold, much larger than their equivalents on Facebook or Twitter. Today we're going a step further and releasing a dedicated Image Gallery feature, to showcase images from across your forum. We've also improved image browsing throughout the platform. Check out our demo forum to find out how. A client came to us recently, looking to start a fashion community for inexperienced forum users. The challenge? 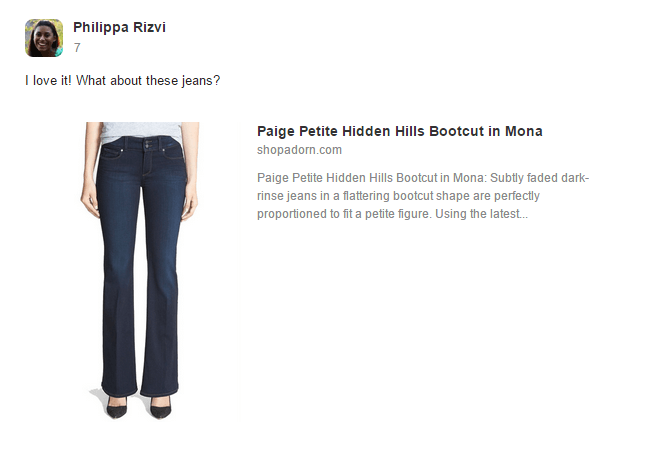 Turn product links into something more informative and enticing, without any user intervention. The solution? A new PlushForums feature that turns plain URLs into rich links, complete with images, titles and descriptions. Everything works automatically and we think the results look great! If you're starting a community that revolves around products, reviews or news stories, this feature could be right up your street. Pre-moderation has been the most common feature request we've received lately. However, we've always been hesitant to develop it. Each post has to be approved manually before it appears, creating a frustrating user experience. But we're open-minded, so we asked each potential customer for their rationale. Each case had its own merits, like sensitive subject matter, a vulnerable audience, or some other content curation requirements. So we went to work. You can choose to moderate every post, or only those that contain media or attachments. You can also set a trusted user level, so regular commenters can skip moderation. You can even target a specific category, making PlushForums the ideal platform to conduct a live Q&A session, where you pre-screen the questions in real-time. If you need pre-moderation, sign up for a free 14-day trial of PlushForums here. Excuse us while we hold back the tears. 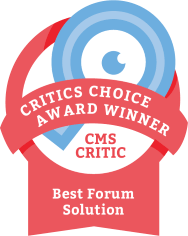 We're proud to say PlushForums has just won the 2014 Award for Best Commercial Forum Solution at CMS Critic. Judges Mike Johnston and Kaya Ismail are two of the savviest CMS experts around, so this is really great recognition for a startup like us. PlushForums takes just 0.5 seconds to fully render a page. Discourse takes 3.1 seconds. Fortunately, we have something called HipHopVM in our arsenal. This is a tool written by Facebook to power their own service. In their words, "HHVM is an open-source virtual machine designed for executing programs written in PHP. HHVM uses a just-in-time (JIT) compilation approach to achieve superior performance." And they're not kidding. HHVM gives us a 152% speed boost over PHP 5.5, which is more commonly used. That makes for a better service and happier communities. We admit to being a little bit obsessive when it comes to clean, consistent design. 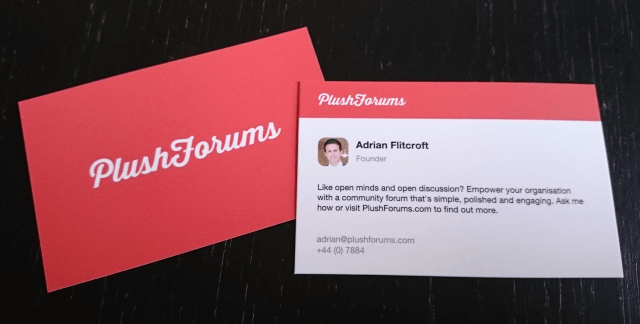 If you've tried our demo forum, these new Plush business cards should look familiar! We've been passionate forum users since the mid-90s. Today, forums are still the place to find genuine expertise, community spirit and diversity of thought. We also believe there's no better way to engage with your customers or share knowledge within your organisation. That's why we've put all our energy into creating the most user-friendly forum experience ever, with beautiful design, real-time discussions and a huge range of features. And there are no plugins to install, no servers to manage and no expensive developers to hire. You can focus on building an online community your members will love. And we promise to help you do this at a reasonable price. After many years working with online content and web products, it's a dream come true for our team to launch our own business. We hope you'll join us on this journey! Ready to try Plush? Free for 14 days, cancel any time.